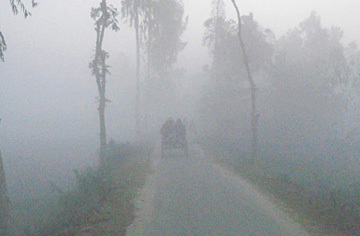 moderate cold wave is sweeping over Mymensingh, Dhaka and Barishal divisions. Moreover, mild to moderate cold wave is sweeping over the rest parts of Rangpur, Rajshahi and Khulna divisions and the regions of Sandwip, Sitakunda, Rangamati, Cumilla, Feni, Srimangal, and it may continue, a Met office press release said today. Weather may remain dry with temporary partly cloudy sky over the country while light to moderate fog may occur at some places during late night to tomorrow morning. The country’s highest temperature on Friday was recorded 26.5 degree Celsius at Teknaf of Cox’s Bazar while today’s minimum temperature was 5.2 degree Celsius at Rajarhat of Kurigram. The sun sets today at 5.21 pm and rises at 6.40 am tomorrow in the capital.